Training Treasures: Race Car Board Game FREEBIE! You are going to love this FREEBIE! I love mothering boys. Truly, I do!! But what irritates me more than anything is that I have such a hard time finding boy products! Don't believe me? Go down the girls shoe aisle at Walmart. Then go to the boys . . . erm- slot. I don't even know the word for it because the boys sure don't get a whole aisle (or two) dedicated to their footwear! I take pride in my boys and want them to look just as cute as if I had a daughter. The same goes for education. I have a hard time finding printables designed for boys. Gender neutral? Yes! But my picky two-year old wants CARS, not zoo animals! And that is how this cute printable was born! My boys love race cars and were enthralled with the graphics on this game! 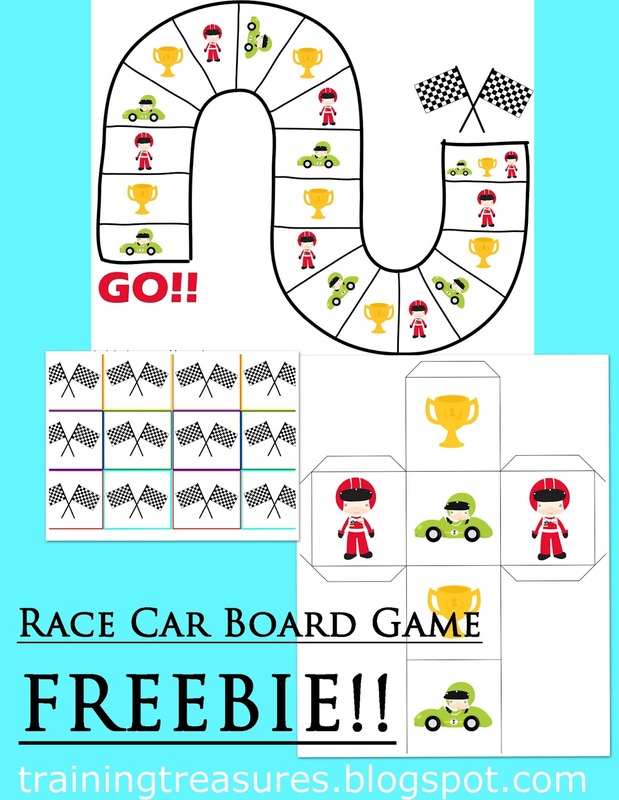 Instructions are included in the download for making and playing this game. The best part? You can program it to design your child's needs- whether it be addition, subtraction, or phonics! Have fun! We sure are! Visit my Teacher's Pay Teachers Store to download HERE.